Citronella oil is popular as a natural insect repellent. Enjoy your outdoor ambiance even more by burning Citronella and Cedarwood natural insect repelling essential oils. All-natural, handcrafted candles formulated with 100% essential oils to keep bothersome mosquitoes and other flying insects away. Our special soy wax blend has also been formulated to use as a moisturiser when the wax has melted to a pleasant temperature. Apply to the skin to nourish and soften in addition to personal insect repellent protection. Soy candles are clean-burning, sustainably sourced and eco-friendly. Increase the absorption ability of the essential oils to maximise their effect. This product not only contains high quality 100% soy wax, high grade essential oils and added jojoba oil, but is designed so that you can use the oil directly onto the skin providing a lovely warmth before application to the skin. Soy Wax, Jojoba Oil, Citronella Essential Oil, Cedarwood Essential Oil. Hydrogenated soybean (soy) oil, Simmondsia chinensis (jojoba) seed oil, Cymbopogon nardus (citronella) leaf oil*, Cedrus atlantica (cedarwood) bark oil*, Citral*, Geraniol*, Linalool*, Citronellol*, Limonene*. "What a wonderful candle product! No problems with flying intruders to the home while the candle is burning! A very natural way to keep your home free from unwanted flying insects but with a lovely scent from the cedarwood mixed with the citronella. A summertime 'Must Have'!" "Absolutely adore this travel essential. 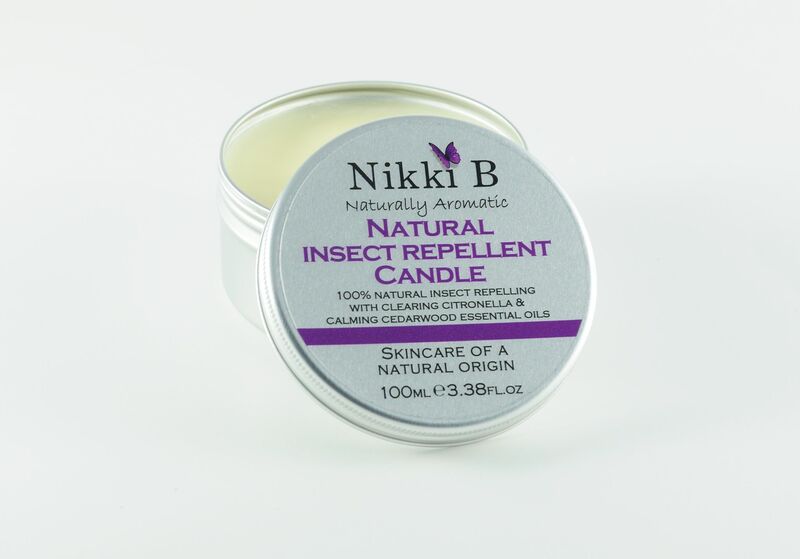 If you like the outdoors life either abroad or in your garden and want to create a candlelit atmosphere and protection from pesky bugs... pack one of these... the smell is divine. Knowing it is made naturally is a wonderful bonus. And they last such a long time ! Such great value. Highly recommend."